The workarounds I came up with were either to use center-justified attributes (not always practical), or to use visibility states for the left and right versions (also not ideal, since you had to enter the attribute value twice). LT 2008, though, introduced multiline attributes which adjust their justification when flipped. It's an extra click to access the value, since you have to launch the attribute editor and then the multiline attribute editor, but I think the flexibility of the multiline attribute (and getting rid of the visibility states) makes it worth it. What do you think? How do you handle "left" and "right" versions of blocks? I'm teaching a class on Dynamic Blocks tomorrow at the AUGI CAD Camp in Virginia Beach, so I thought I'd share a tip from it with you early. One popular question on the discussion groups is how to stop attribute text from rotating when you rotate the rest of a dynamic block, so it always stays horizontal and readable. I'm assuming you're already in the Block Editor for a block with an attribute in it somewhere, but no parameters or actions. Add a point parameter at the insertion point of the text. Use the Properties palette to set its grips to 0, and set Chain Actions to Yes. 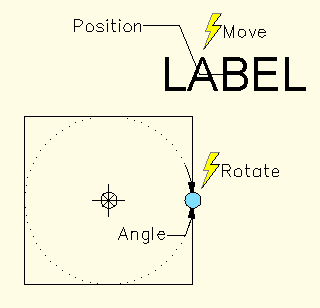 Add a move action to the point parameter and select the text as its selection set. Add a rotate parameter -- use whatever base point, radius, and angle makes sense for your block. Add a rotate action and select whatever geometry you want to rotate AND the point parameter. Do NOT select the text or the move action. Close the Block Editor and Save changes. That's it -- when you use the rotate grip to rotate the block, the text circles around but stays horizontal. Pretty cool.